January 2016 – Concurrent Technologies announces FR 341/x06, a new 3U VPX™ ExpressFabric® switch. 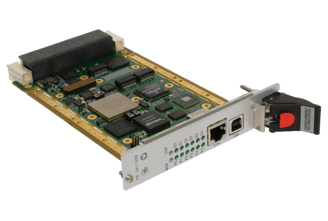 FR 341/x06 supports six payload boards and is based around an Avago Technologies PEX9700 series device which is fully Gen 3 PCI Express® compatible with additional ExpressFabric capability. 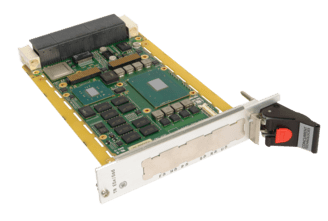 Similar to Concurrent Technologies’ existing FR 331/x06 3U VPX switch, it provides PCI Express data and Ethernet control plane links but with the advantages of higher performance and more flexible configurations to suit a myriad of system topologies. FR 341/x06 has a default configuration that enables a single processor board to act as the PCI Express root complex for up to five additional payload boards connected via the data plane. In addition, two other modes of operation are supported called virtual switch and fabric mode. The virtual switch mode allows multiple partitioned root complexes to be set up which could, for example, enable three individual clusters consisting of pairs of boards to be set up within a six slot system. The fabric mode allows multiple root complexes with links between the clusters, enabling extremely flexible configurations while still using standard PCI Express enumeration. Previously this type of PCI Express configuration required the use of additional hardware on boards to implement non-transparent bridge capability adding complexity and power consumption. At the solution level, multiple hosts residing on PCI Express fabrics communicate through an Ethernet type of protocol enabling socket based application software to run without modification. There is also a special host-to-host communication capability for short packets, called Tunneled Windows Connection, which enables message based applications to share small amounts of information with very low latency. FR 341/x06 will initially be shipped as an air-cooled variant with Gigabit Ethernet and USB connectivity on the front panel. A rugged, conduction-cooled variant, that will be suitable for deployment in many challenging environments, is expected to be released later in 2016 after additional qualification testing has been completed.